Finland’s Ward have been at it since 2005 and this their self-titled album is sure to put them on the map. It’s also their debut full length, as their previous releases have been two split records /cassettes. This album has been recorded and worked on since 2011 and is recorded totally analogue in Black Floyd studio owned by the bass player of Ward. Even though the making of the album have been such a long journey it doesn’t sound at all over worked as you might think it would. The sound is just as heavy and bleak as this sort of music should be. Be sure to be fast if you want to own a copy when it comes out in this month as it will only be released on vinyl and in 500 copies. 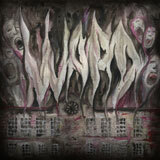 Ward plays dirty slow and doom / death oozing metal with a punk DIY attitude and the songs are presented in both English and Finnish with high pitched guitars that adds to the death metal feeling and brings me back many years to the first ever death / doom metal I experienced. It’s old-school for sure and that my friends is a very good thing. With four songs clocking in on around 36 minutes it leaves you in total emptiness and despair yet still yearning for more. As Ward haven’t been as active recording their material they have been more active when it comes to playing live and have toured and played with bands such as Switchblade, Fleshpress and Crude. Their sound is raw and unpolished and yet they capture an atmospheric and melodic touch to it all and with a bunch of very catchy riffs. Catchy in the good sense that makes you want to bang your head in the praise of death. Some nicely timed tempo changes and acoustic parts helps give it that little bit extra making Ward a unique commodity in today’s death fueled doom metal. A strong hint of the old school Scandinavian death metal is heard throughout the Ward repertoire. These morbidly insane Finns will certainly put you in the ward, the psych ward. Finland have done it once again and those of you living in a close vicinity to Tampere, Finland should get yourselves to their release party which is held on the 7th of December in Vistavirta-club and joining them is Lurk and Crippler. If not then be sure to get their album or check out the Bandcamp site. This album is released with the cooperation of Tuska & Ahdistus Records, Pupu’s Bistro, Rämekuukkeli Records and Johnny Park Avenue Records, with artwork made by Finnish artist / graphic designer Ville Angervuori.